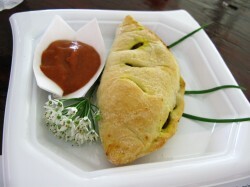 Look at them, with their smooth jade green skins and distinctive ovoid leaves. They are the largest native North American fruit, and they are the only species in the tropical custard apple family, Annonaceae, to grow in temperate climes. A distinctly Appalachian fruit, the has a unique flavor and texture; its flesh is creamy and rich with a complex variety of aromas and flavors depending upon ripeness, variety, and growing conditions. Most people say that pawpaws taste like bananas mixed with a range of fruit flavors from mango, papaya, berries, or melons. What I found two weekends ago when I was privileged to serve as a judge for the 10th annual Ohio Pawpaw Festival’s best pawpaw contest and pawpaw cookoff, was that saying that pawpaws taste like bananas does the unique fruit a disservice. The truth is, they taste like pawpaws. And the truth is that pawpaws have so many flavors locked into their skins that it is very hard to describe exactly what it is that they taste like. But, I, a confirmed banana-disliker (I don’t hate them–I just don’t like them much), found that there were more differences in the flavors of the two fruits than similarities. Bananas tend to all taste alike–like bananas. When I was pregnant with Kat and would eat bananas as snacks because I could stomach them and they were good for me, I used to complain, “You know, I wish bananas came in another flavor, but all they every taste like is bananas.” Unlike other fruits like apples which vary widely in flavor, texture, color and aroma, bananas are pretty much bananas. At least, that is, when it comes to the ones we buy in the grocery stores. Bananas grown in their natural climate not for shipment to colder zones may indeed have diverse flavors, textures aromas and colors. But, in my experience, a banana is a banana is a banana. 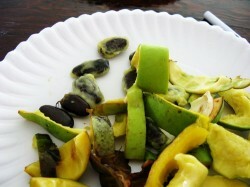 As you can see, I got to taste a whole lot of pawpaws in one afternoon. Fifteen different entries into the best pawpaw contest, to be exact, although I know we tasted more than fifteen individual fruits. Each entry had to include three pawpaws and some of these fruits differed so much from each other that we tasted more than one from some of the entries. And what I can say is this: I am astounded by the differences in flavor among the different fruits. Many of them tasted more of melon to me than banana–some of them had the exact scent of a ripe cantaloupe, while others had the more delicate flavor of a honeydew or even the flowery taste of a watermelon. Others tasted very custard-apple like–which makes sense, because the two fruits are close relatives. Some did taste sort of banana-like, but there was always an aftertaste that took the pawpaw away from the banana and into another realm entirely. Only one of the fruits was truly horrid. What is also interesting about the highly variable nature of the taste of pawpaws was that so much depended on how ripe the fruit was. One overripe fruit the panel of judges (which included a local radio show host who is a local food fanatic, a food writer from Columbus, myself and a woman who studied pawpaws at Kentucky State University) found especially interesting. When I took the first bite I was shocked to discover the very distinct and unmistakable flavor of burnt caramel. It tasted exactly like sugar that had been caramelized just a hair past the caramel stage and into the slightly burnt stage. It had that exact sweetness tempered with an edge of burnt bitterness. It was fascinating. I, of course, thought that one could definitely utilize such a flavor, in a custard or flan say, or perhaps in creme brulee. Another discovery I made was that very slightly underripe fruits–ones that would be technically ripe within a day or two, so they were soft enough to eat, but not really sweet, tasted almost exactly like Haas avocados. They had the same buttery texture, because the flesh hadn’t softened to the custardy consistency that is typical of ripe pawpaws, and the same lightly sweet, rich flavor that a good avocado has. I couldn’t help but think it would be fun to experiment with slightly under-ripe fruits to see if I could make a native Appalachian quacamole with them. The only non-temperate produced ingredient would then be limes, which I cannot believe I could make a good guac without, though I might try replacing them with some homemade apple cider vinegar from Athens county. That might actually work. Sweet dishes are a natural for any fruit and two desserts in the PawPaw cookoff really stood out. 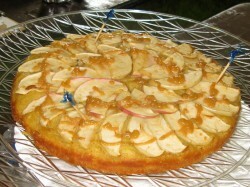 One was the PawPaw Apple Torte, pictured here and the other was the winning dessert, PawPaw Fosters Cream Pie. Both of these recipes used the natural flavor of the pawpaws to great effect and both managed to be delicious desserts without being too sweet, which is impressive. My favorite pawpaw dessert of all time, however, is Chef Scott’s PawPaw Creme Brulee from Restaurant Zoe, which used to be in The Plains, but recently moved uptown in Athens. He uses pawpaw puree in the bottom of his ramekin, then puts in a not-too sweet vanilla creme over top it and then after the custard is baked, of course, burns a crackling sugar crust on top. That is one magnificent ending to a meal right there. Another great pawpaw dessert though, is Snowville Creamery’s PawPaw Ice Cream Sandwiches. Featuring Snowville’s rich cream, the pawpaw ice cream, which is churned using this very Gilligan’s Island-looking contraption with a bicycle, is placed between two chewy-homemade gingersnaps. That is a great combination of flavors, textures and aromas, although I think that everyone who eats one of those ice cream sandwiches should probably take a turn on the bicycle churn, just to offset the calories consumed! 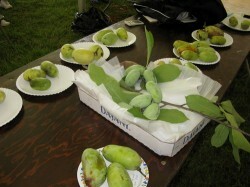 The Ohio PawPaw Festival is definitely a fun regional food event, and is well worth attending. 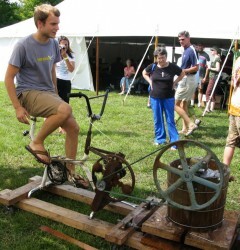 In addition to the pawpaw foods to taste, there are workshops on growing pawpaws and all sorts of other country-living skills, there are wagons pulled by magnificent draft horses, talented local musicians, and great craftspeople, all coming together to celebrate Appalachia’s native fruit. 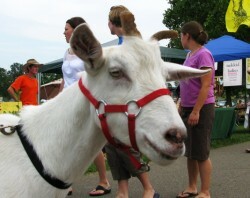 Folks bring their kids, their dogs, their goats (no kidding–see that pretty Sanaan I photographed!) and have a great time–some of them even camp at the site all weekend, which must be fun. Even if I don’t get to attend as a judge for any of the contests next year, I have been asked back to do a pawpaw cooking demonstration. Maybe I’ll use underripe pawpaws and make Appalachian guacamole, or Appamole. That could be fun! Where do you live then? Around here, I can routinely get two of three or four different types of bananas – the common type (Cavendish) and then there’s the little red bananas, the little black and yellow bananas, and one other I can’t recall. Interestingly, the Cavendish is the inferior replacement of the Gros Michel banana which was popular well up into, what, the 50s? Except that it got mostly wiped out by fungus – like the potato famine, but with bananas – and they had to scramble for a replacement. Cavendish doesn’t, I’m told, taste as good as Gros Michel, and it doesn’t ship as well either, but it *did* have a resistance to that particular fungus. Incidentally, the reason bananas all taste alike to you is the same reason they’re prone to being wiped out with plagues of various sorts. Like potatoes, they’re propagated asexually. I’m lucky enough to live in a tropical climate where we have all sorts of bananas, each with their own unique flavour — nothing like that flat cardboardy Cavendish non-flavour. The ones I buy most frequently are red bananas, which have the most beautiful deep pink-beige flesh (the texture of which isn’t at all chalky, but rather luscious and smooth) and taste faintly like mangoes. I brought back 2 small jars of paw-paw jam to Chicago after participating in the Ohio Beer Week festival earlier this year. I caught all kinds of grief from the guards at the Columbus airport who wanted me to a)dump the jars or b) mail them to myself. After I pointed out that they really weren’t “liquids,” they relented and let me take them on board the plane, but only after they opened a jar and “tested” it. I always get the evil eye at the metal detector station because I have 2 hip replacments and make the alarm go off. I’m 58, lilly-white and half-bald and carry a cane. Apparently the addition of 2 jars of paw-paw jam from Athens put me on the top of the profile of possible evil-doers. I forgot all about the Paw-Paw festival and had promised myself I was going to attend this year’s event. BTW, I sampled a paw-paw beer and thought it was a waste of a good beer. I have pined for paw-paws for forty years. Next year in Jerusalem! Attending the Pawpaw festival in Athens, OH will be very tough for me considering the time of year it happens. I do, however, find it very convenient to pass through Athens on March 27th of this year. 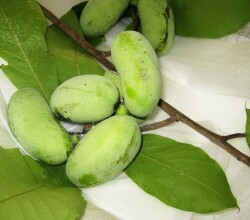 I am very interested in Pawpaws (just ordered some to plant) and would love to expose my wife and family to something pawpaw if possible. Any suggestions – restaurants? orchard/grove/backyard tours? demonstrations? – anything happening that time of year with pawpaws? Or is Athens, OH just so great that it’s worth a spin through on the way from Michigan to South Carolina? I’d appreciate whatever info you can send my way. Thanks.